Today, we’re gonna talk about the free Photoshop substitution called Paint.NET. Apparently it is supposed to be the best freeware when it comes to photo editing, so, I thought, why not test it? And, don’t worry, in Paint.NET you can still use Photoshop brushes with a little help from one plug-in but we’ll talk about it later. When I went to download Paint.NET, the first thing that stunned me was the size of that software. 1.6Mb! Now, that’s small! It’s probably fast as well! So, download was quick. Installation, not so much but to work with it is really fast. Of course the interface and the features of Paint.NET can’t come nowhere near the features of Photoshop, but keeping in mind the price difference (Paint.NET is free) and the average need of the designer-beginner, Paint.NET can be just fine. To install Custom brush plug-in just place it to “Paint.NET/Effects” folder. 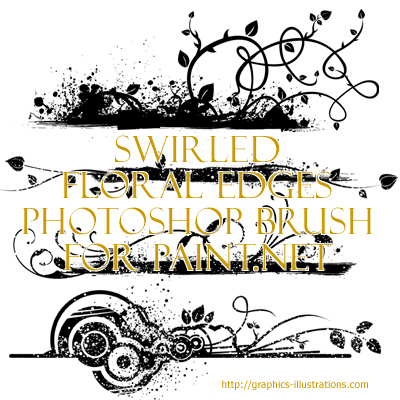 Please note: These brushes are downloadable in .png format. Since those are not in 100px x 100px (96dpi) the best way to use them, is to import them into Paint.NET using “Layers -> Import from File” command. Help! I did everything you said here but the brushes come out ugly! Meaning it automatically resizes to 100×100 and becomes bad! How do i fix this? We noticed that and updated the tutorial. I am sorry for the inconvenience, I was supposed to emphasize that in the tutorial, but now I revised it. I just extracted the files to my desk top and saved them to where you state – (My Documents/Paint.net user files/custom brushes) but it’s just the .abr files that I downloaded, I can’t get the pngs. What I am doing wrong? I have also installed the plug in and they don’t appear in that. Nicola, what you need to do is put .png files there, not .abr. So if you have .abr get the abrViewer software that I’m referring to in the post. Convert the .abr to .png using abrViewer and place .png files there. I didn’t pick that up from the tutorial above. …I’m so confused! The plug-in doesn’t work (I click ‘Run’ and the message that comes up is; ‘This file does not have a program associated with it for preforming this action. Create an association in the Set Associations panel’… huh? ), and I can’t find the Effects folder to but my brushes in! Help…? ” and i placed it in the Paint.Net program file “Effects”. i’ve tried opening the plug-in but there is a pop-up stating that it can’t be opened because it is a .dll file extension. i have no idea where to go from here & i can’t seem to find a .dll file extension or any file extension opener program anywhere on the web. please help!!! much appreciated. I downloaded the brushes for paint.net,but they are .dll, I placed them in the effects folder,but how do I use them? ?, any ideas? ?,please help me. Thanks. Hey, I can’t seem to find the Paint.NET user files in my computer! Where are they? Thank you!! Hi, i downloaded and installed the plugin, but everytime i try to start the “draw with custom brush” in effects, paint.NET crashes ! HI Nicole, thanks for the free brushes. I have them installed correctly but am wondering if i am using them properly. when i draw with the brush they are very squashed up and very blurry…is there a setting that i should be using that im not? how to import plugins and effects from photosop to paint net? Okay so when I went to download the plug-ins it didnt work. It sent me to a page that didnt allow me to do it. how do i use dll files after i put them into the effects folder? they won’t show up in the draw with custom brushes list . I can’t find my effects folder. I have found all of the locations. I opened Paint.NET, it said I’d installed the plugin in ‘Utilities – Plugin Errors’ and it said it was known to cause instability, and so wouldn’t allow it to be opened. I also noticed that I have version 5.2, and that this is for 5.1. I have no idea where you get the newer version and this is a rip off if you have to keep on downloading it and going through this bother every time this fantastic programme updates itself, which it often does. If anyone can help me, it would be much appreciated. Not happy with the results. I don’t know what to tell you because the plug-in worked fine for me. Maybe you could post your question to their support forums? Anyway, I don’t see the rip off here because Paint.NET is free. I hope you did not pay for it. I cant find the custom brushes from user files, there is only ”palettes” what can I do? I can’t find custom brushes from user files. This is really good although, using the mini plug in you cant add textures to the whole photo? i used to be able to add a whole texture to a photo and blend them in together? is there any other way to do this? ?